Several factors are making us shift more toward going paperless: the need to be mobile and location-independent, greater speed and convenience, an increased awareness for going green, not to mention our need for pinching pennies in today’s economic climate. Now, with the advent of things like smartphones, tablets, and the iPad, (s aapl) new applications designed for those devices are making it easier and more practical to go paperless. Penultimate by Cocoa Box turns your iPad into a notebook, allowing you to jot notes and create sketches in multiple colors, separate them into notebooks by topic or project, and then email all or part of your notes in PDF format. It even includes three built-in “papers” (graph paper, unlined and ruled), but you can import images of different backgrounds or papers — or download paper packs — to create your own texture or style. Price: $1.99. The Android- (s goog) and iPad-compatible PDF reader SignMyPad has built-in annotation functionality, allowing you to sign and date PDF documents right from your iPad and then email it to another party. You can also save documents into versions for gaining multiple signatures, and the app can import documents from and save them to Dropbox. Price: $3.99 for the basic version, $19.99 for SignMyPad Pro, which adds geolocation tagging. If you work with clients or colleagues who still use fax machines, MyFax’s mobile faxing app, available for iOS and Blackberry, (s rimm) lets you send and receive faxes from your smartphone and via your email account. Just snap a photo of the document you want to send (the app is optimized for sending photos of text), choose the recipient from your Address Book and send. To fax by email, attach the document to an email message, address it to the fax number plus an @myfax.com and send. To receive a fax, simply give out your MyFax number, and your received documents will be available as an email attachment. Price: Free app, service costs $10/month after a free trial. 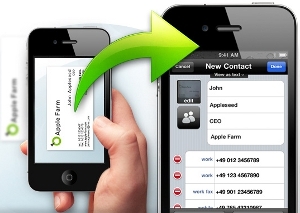 JotNot lets you scan from your iPhone, email the scan as a PDF or image, and fax the scan to U.S. numbers. You can add pages to documents, creating a multi-page scan, as well as delete and reorder pages and send documents to EverNote, DropBox, or Google Docs. JotNot can scan and save a variety of documents, including receipts, business cards, and notes. Price: Free. DocScanner is a scanner app for the iPhone, Mac, Android, Qt, and the Symbian S60 (s nok) that allows you to scan documents simply by taking a picture. It then automatically crops everything other than the document out of the picture and even detects your document’s paper size. Other helpful features include the ability to search multiple-page documents, as well as words within documents. Price: $4.99. The multi-platform Business Card Reader from SHAPE Services lets you take a photo of a business card, and then it “reads” the picture, extracts the contact data, and enters it into your smartphone’s address book. The built-in browser even lets you check out a new contact’s LinkedIn (s lnkd) page right from the app. Price: $4.99 for multi-language support, $3.99 for Asian languages only. 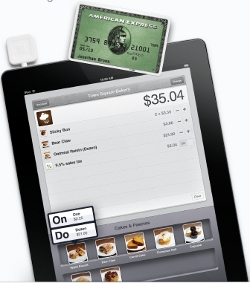 Square, available for Android and most iOS devices, lets you accept credit card payments directly from your smartphone and uses “smart receipts” to send to customers via email or text message. You can create a display with photos and prices so that customers can view your products directly from your iPad, for example, and then keep track of the number of sales you’ve made in a given day. Price: Free app and reader. This is a great article. It is very informative. Should be able to read stuff like this more often. This is a great list, thanks for including our app SignMyPad. We’re big supporters of the paperless movement and really appreciate being a part of this list. Would liked to have seen a review of TextGrabber here (it takes a photo of words and converts them into editable text). I have yet to try it, but it sounds awesome and would have been so useful when I was in the library a lot and didn’t have time to copy stuff out. OR. You can save yourself a light laptop… all the functionality of the iphone (more functionality if you run Windows or open BSD). You’d also save a bunch of money on the actual device itself. We would love to check out Business card reader. It is such a myth that going paperless is like going green. Just the fact that your computer is ON means you are burning fossil fuels and running us more quickly out of resources. Not that I don’t love my computer; I just don’t equate electricity dependence with going green. I’ve actually started doing some research and calculations to see whether replacing paper with computer time is worth it, environmentally speaking. Haven’t finalised it yet, but it seems from what I’ve found that about 11.5g of CO2 is emitted for each sheet of printed paper (9.9g for the paper and 0.6g for the toner). That’s pretty much equal to the amount of CO2 emitted in generating enough energy to power a laptop for 1 hour. So as long as you’re saving at least 1 sheet of paper for every extra hour you have the laptop going when you normally wouldn’t, it’s still worth it. I haven’t done the calculation for iPads, but they use significantly less power than a laptop. I’m glad you are doing this research. I guess some other relevant questions are to precisely wonder about what the 9.9 grams of co2 relates to. Is it the manufacturing costs? Is it the power to the printer? Is it the small portion of gasoline that’s used in the machine that cuts down the trees? The paper itself doesn’t release any co2 (It’s a co2 sink!) But if burnt, it’ll release it’s sequestered co2. I guess that it’s a complicated issue, without even considering the co2 released in the construction of a computer. The 9.9g comes from the Victorian Government Environmental Protection Agency – http://www.epa.vic.gov.au/climate-change/carbon-management/Worksheet_4-Paper.pdf . The methodology isn’t explained in detail, but from what I’ve seen, what’s generally counted in these sorts of things are emissions from power and fuel to harvest and manufacture, and especially to transport the paper. Occasionally you’ll see calculations which also include the carbon that will no longer be removed from the atmosphere by the the tree that got cut down – the EPA figure is clearly not high enough to include that, which is good because to do so would be to ignore the fact that some or all of the paper likely comes from plantation trees. The calculation is for unprinted paper. The extra 0.6g I added for the toner is based on manufacture and transport for the toner itself and for the cartridge it comes in, but the power to the printer/copier is not included. I compared it to the running costs of a computer because, at least in my case, I utilise a computer that I would have owned whether or not I was using it to replace paper. You’re right that it gets a lot more complex if you’re talking about buying a computer that you would not otherwise have bought – there are very significant emissions from manufacturing a computer, as well as the use of a lot of rare earth minerals which cause wider environmental problems in their extraction. I think you’d have to be replacing a pretty massive amount of paper to justify buying an electronic device solely for that purpose. Using paper kills the environment faster than running a computer.Because after agriculture and housing,manufacturing paper is the biggest cause of deforestation. All of Toronto (about 3.2 million people) is powered by hydro electricity. Great list, thank you. I use JotNot Pro several times a week. Great for documenting whiteboards (cleans them up so images are much better than photo), functions as a scanner (and sends to Evernote). SignMyIpad also serves me well. So be warned, JotNot integration with Google Docs sends your gmail creds in the clear.